A good story that reinforces the harshness of Mega-city law and Dredd’s keen senses. It quickly turns into an espionage thriller and sees the return of the Sov Judges, who are still stereotypes. There are some wacky names such as Judge Waldo and the Sov Judge Molotov who only exists to make a joke about a cocktail. We do see the Black Atlantic for the first time. A weak story almost identical to Krong in Prog number five. 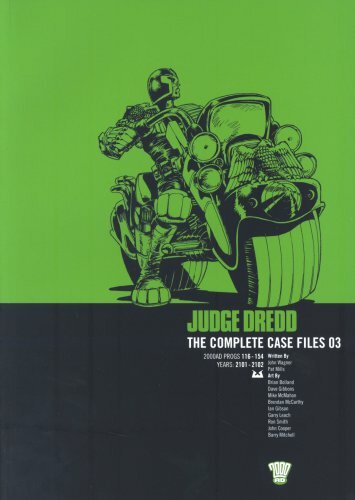 Dredd demonstrates an encyclopaedic knowledge of century’s old English criminals. Ends with a terrible last line. This week’s Cause célèbre is animal rights. Wagner puts his own twist on things but stamps down hard on any kind of discussion with a clearly black hatted villain and Dredd making our moral choice for us. Perfect for a fascist police state n’est-ce pas? This is uncredited and probably justly so as although there are plenty of Dredd elements, such as Walter and Max Normal, the whole thing lacks any kind of sparkle. Dredd utters nonsense about how synthetic caffeine is illegal and Max Normal speaks far too normally. The premise of a suicide arcade where people risk their lives against deadly slot machines was done better as “You Bet Your Life” in Prog 25. This has a longer page count than usual but doesn’t do anything notable with it. A slightly longer, Mega-city in peril, story that Wagner excels at. Some 20th century fun poking, a bit of politics, a quirky antagonist and 70’s disaster movie riff. All enjoyable stuff. The character of little Ralphy is an interesting one and maybe shares emotions with 2000AD’s young readership. You do wonder if Wagner was told to make Dredd appear more human or have him show more empathy as this and the earlier Vienna story both have him acting uncharacteristically paternally. A stimulating sci-fi concept and a good hook but the tiny page count means that there isn’t enough depth for the whole thing to hang together. The relationships between the criminals aren’t satisfactorily explained weakening the whole plot.